A handsome mix of Roman and Gothic, Saint Jean Cathedral stands out in the cobbles of Vieux Lyon, chiming its bells to lure visitors through the huge oak doors. 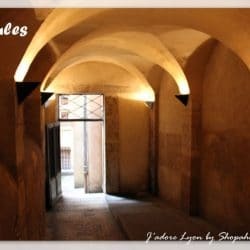 The narrow strip of cobbles of Vieux Lyon, along the right bank of the Saône in Lyon’s 5th district, is home to the largest Renaissance area in Europe after Venice. A colourful mass of craft shops, restaurants, ice-cream vendors, old postcard sellers, buskers and bars, it is punctuated by two churches and a Cathedral – St Paul, the furthest up stream, known to have been the commercial area during the Renaissance, St Jean Cathedral in the middle, home to wealthy aristocrats, and St George downstream, the craftsmen’s district. Just think of the Beatles, but without Ringo. 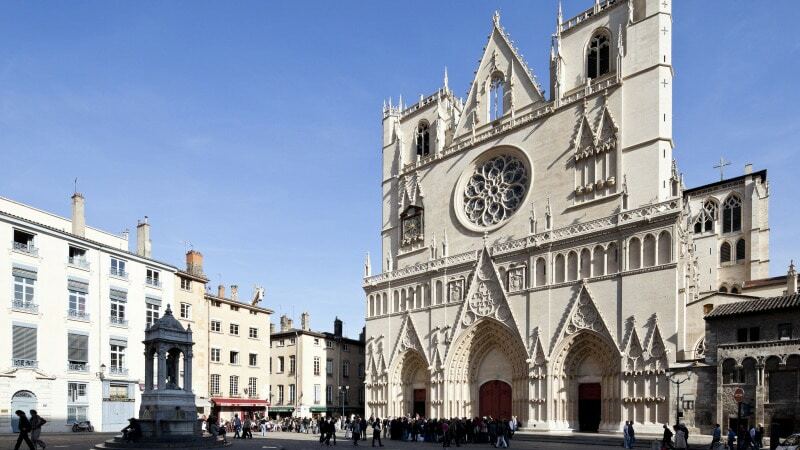 It’s St Jean Cathedral, in the beating heart of Vieux Lyon, that visitors flock to see. Classed historical monument since 1862, World Heritage in 1998, St Jean Cathedral reflects in its architecture both the story of the city and the very drawn-out building process which took over three centuries to finish – from 1175 to 1480. 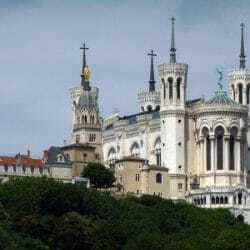 Romanesque and Gothic in its style, it has weathered religious wars, renovation work and political discord, to become one of the most important symbols in Lyon. From the Saône, it looks a little squashed between two yellow buildings, but go around the other side and discover a roomy piazza and one hell of a buzz. 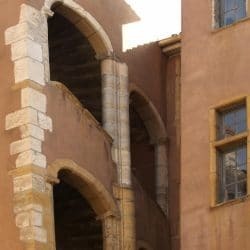 Through the big oak doors to St Jean Cathedral lie a spectacular 16th century astronomical clock, an array of stunning lamb rose stained-glass windows from the beginning of the 12th century, and stories upon stories from the Old Testament to the New. Built by N. Lippius of Basle, this clock was finished in 1598. The mechanism is of sturdy wrought iron, and includes both a perpetual calendar and a religious calendar. This incredible clock can calculate the dates of all saints’ days up until 2019, as well as the position of the stars above Lyon. A new one is planned for 2020 by Charles Morat, and will work until 2084. As for the perpetual calendar, it will carry on ticking until 3008, believe it or not. Within the oval minute face, several moving figures ‘come to life’ at noon, two and three o’clock, with automatons in the form of different animals and a scene depicting the Annunciation. What does St Jean Cathedral’s ridiculously long name actually mean? Officially, St Jean Cathedral is called “la primatiale Saint-Jean-Baptiste-et-Saint-Étienne”, dedicated to both St John the Baptist and St Stephen (St Etienne) and has the title of “primatiale”. This was because in 1079 the Pope granted the archbishop of Lyon the title of Primate of All the Gauls with judicial supremacy over the main archbishops of France. The name primatiale continues even now, though the archbishops of Sens and Paris and their provincial dioceses have not been subject or subordinate to the Archbishopric of Lyon since the French Revolution. The holder of the title since 2002 is one Philippe Barbarin, a respected though controversial figure in the Lyon landscape. The St Jean area is generally crowded in the afternoon, especially at weekends. So to really sup up its architectural beauties, the best time is in the morning. Sit by the fountain in the piazza outside and listen to the bells chime. Sip a grand crème in the very retro and moody Café de la Cathédrale, right next door. Adjacent to St Jean cathedral (on the northern side), a lovely archaeological garden shows the remains of the religious buildings which occupied the site before the cathedral was erected. The oldest remains date back to the 4th century (baptistery of the former St Etienne church). A very atmospheric wander, and almost peaceful. Guided tours in several languages, including English, are available from the tourist office (€9). M-F 8:15AM-noon, 1:45PM-7:30PM, Sa Su 8:15AM-noon, 1:45PM-7PM; services (no visits) M-F 9AM and 7PM, Sa 9AM, Sun 8:30AM and 10:30AM (high mass).